Each year, Quench sets out in search of Canada’s culinary visionaries – The Mavericks – those chefs who are leading the charge of what’s fresh and exciting from coast to coast. This year’s Maverick Chefs, including Chef Mitchell Bates from Grey Gardens in Toronto, are four innovators focused on incorporating sustainability into everything they do – from planning to creating to planting to cooking. Cooking sustainably is no easy feat; it has its own set of unique challenges, which these Mavericks navigate. However, it does result in a host of positive benefits for our bodies, our communities and our environment. I spoke to Bates to learn more about what sustainable cooking means to him and how this impacts every recipe he creates. He shared the ups and downs (and every lesson in between), highlighting why he deserves to be called a Mav Chef. Bates learned a lot by working in big cities throughout his 14-year cooking career. Originally from Washington, he moved to New York City to get his degree in culinary arts, and the Big Apple did not disappoint. Bates stayed to work in the city for several years, soaking up new culinary experiences and opportunities. Most notably, he cooked at the Michelin-starred restaurant Momofuku Ko, where he rose through the ranks, and eventually, he took an opportunity to work as a chef of Momofuku Shoto in Toronto. It was around that time that Bates was approached by his future-restaurant partner Jen Agg to see if he’d be interested in collaborating. Bates said yes, taking on the brand new role of partner, on top of chef. Bates and Agg opened Grey Gardens in March 2016 in Toronto’s hip Kensington Market neighbourhood. The wine bar serves up “New North American” cuisine, as they describe it. While the menu touches upon a wide variety of tastes, one thing is certain: sustainable cooking practices are applied as much as possible to each dish. Bates, who views sustainability more as an expectation than a trend, focuses on buying local produce, using ocean wild seafood, and reducing waste for every recipe he creates. Why is sustainable cooking so important to you? All chefs should be concerned about it and it should be a focus in what they are doing. Restaurants are pretty much a luxury, and while I don’t want to say they waste a lot, they are a semi-burden a little bit. Anything you can do to relieve that burden, whether it’s buying local or things of that nature, it’s good for the entire industry. At Grey Gardens, we try to have most of the fish we buy be either ethically farmed or ethically fished, where their populations are controlled. We use a lot of ocean wild seafood. For produce, we try to use what is local if we can — if not, at least Canadian. We also try to use the whole thing; we never use the best part and throw away the rest. We use all of it to cut down on waste. 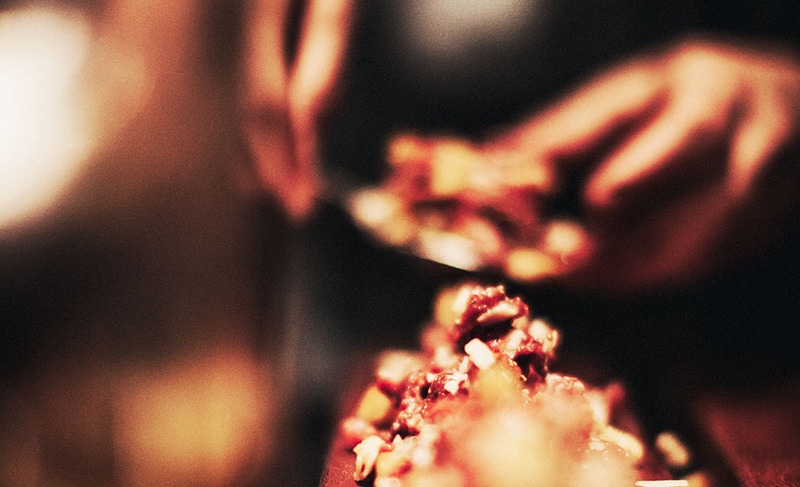 What elements of sustainable cooking did you take from your time at Momofuku? It was pretty much a similar philosophy. They use a lot of local produce and companies that dealt with local farmers. Meat was also from the area. What’s the biggest challenge associated with sustainable cooking? You just have to be aware and plan for it. Otherwise, no particular challenges. What’s your process for sourcing local when working in an urban landscape? Luckily in Toronto, there are a lot of companies that have that goal of sustainability as well. I wouldn’t say it’s too difficult to source local ingredients, as such. Initially finding those companies might have taken a little research, but once you have a network, it is a little easier. How important is locally sourced wine for Grey Gardens? While I’m not involved in the wine purchasing, I believe all the wine is from Ontario. We even had one from Nova Scotia for a while. Your co-owner Jen Agg was vocal on Twitter about some of top trends for 2017 in food and cooking (including locavores and sustainable seafood). Do you think sustainable cooking is the new norm instead of a trend? I wouldn’t say it’s a trend at this point. More and more people are turning their focus to that. Even if restaurants aren’t 100% sustainable, there’s at least a certain percentage they are. I think people have come to expect it when they go out to eat. In a modern type of restaurant, I would expect it too. At this point, I aim for function over fashion. I try to make everything taste good. If it doesn’t look that great, I’m not too concerned. Tasty is the number one goal. Sometimes you eat things and it doesn’t have much taste, so tasty is first and foremost. What are some of the challenges in transitioning into a role of partner on top of chef? It’s more to worry about. A lot of times, you have to take yourself out of the physical responsibility of doing it. Before you would do it, and all that other stuff was taken care of by someone else. Now your responsibilities have to expand and you have to take care of more. It’s multifaceted rather than sticking all your energy into one area of it. What advice would you give to those looking to pursue a career in the culinary arts? Work hard and learn as much as you can. Learn to walk before you run; don’t think you’ll become in charge of something in five years. Take the time to learn and absorb everything. There will be long hours and you’re going to have to do it, but in the long run, it’ll help. Sometimes new cooks want to jump the line and that can hurt you more than it helps you. What do you enjoy most about American fast food (which seems like a completely 180 from the offerings you’re known for)? It’s just something I grew up with. Consistency of it and the novelty of it are what I enjoy most. Favourite local ingredient to work with? Peppers and chilies at the end of the summer. What’s your favourite dish to eat? Clean mackerel and brine for 30 minutes in salt and water. Remove from brine. Grill in a hot pan, skin side down unlit cooked through. Season with nice shoyu and lemon juice. Garnish with the Salsa Verde. Dice all the vegetables and grill in a 375˚F oven for 20 minutes. Remove and let cool. Put all the ingredients in the food processor and pulse till thick. Amanda currently does communications for a global beauty retailer. She's a freelance writer, bibliophile, make-up collector, and an avid fan of the CFL. She loves writing about food because it always turns out just right - unlike her forays in the kitchen.